The term “assessee” is important in Income Tax as it defines the person who will be liable to pay income tax under different circumstances. The “Assessee” may be any person who is liable to pay taxes on the income earned by him or pay taxes on behalf of any other person. A person by whom any tax or any other sum of money (e.g. penalty/ interest) is payable under Income Tax. Every person in respect of whom any proceeding under this Act has been taken for the assessment of his income/loss; or the amount of refund due to him. This category covers a person to pay taxes on the income earned by him. 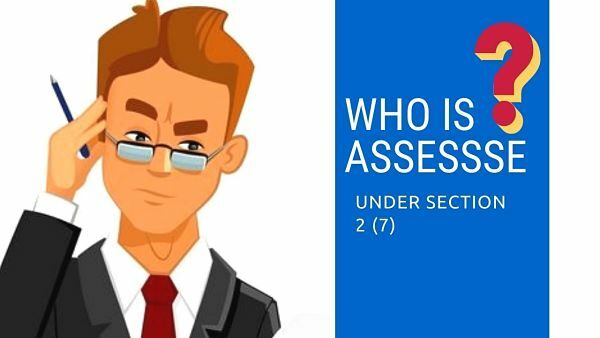 Every person who is deemed to be an assessee under the Act. Every person in respect of whom any proceeding under this Act has been taken for the assessment of the income/loss of any other person in respect of whom he is assessable or the amount of refund due to him or to such other person. This category covers a person to pay taxes on behalf of any other person in specified circumstances. Every person who is deemed to be an assessee in default under the provisions of Act. This category covers a person to pay taxes or other sums (penalty/ interest) in the specified circumstances when he fails to fulfill his legal duty as per the Income Tax Act. For example, a person who fails to deduct tax at source (TDS). What is the Meaning of Assessee in Hindi – अस्सेस्सी का हिंदी में अर्थ क्या होता हैं? What is the difference between “assessee” and “person” under Income Tax? The terms “assessee and “person are not synonyms. The term assessee is defined in section 2(7) whereas the definition of ‘person’ is given in section 2(31). Every ‘assessee is a ‘person’ but every ‘person’ may not be an ‘assessee’. Who is responsible to pay tax and file Income Tax returns in case of death of taxpayer? In the case of death of the person, the legal representative of the deceased person shall be liable to pay tax and file income tax returns [Section 159 of Income Tax Act, 1961].